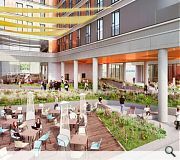 Halliday Fraser Munro Architects acting on behalf of Atholl Square Developments have drawn up plans for a ‘landmark’ student housing development and public square outside Aberdeen railway station. 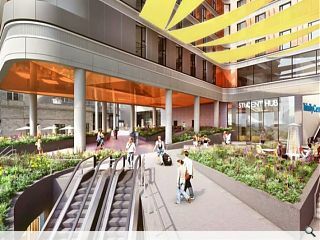 Replacing the existing Atholl House, built in the 1970s, the scheme aims to improve connectivity between the station and Union Street by decking over the existing railway tracks. Above this will rise a trio of towers, the highest of which will sit in the centre as part of a ‘rising wave’. 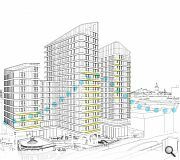 In their design statement the architects said: “Activity at high levels is articulated through inset windows and balcony’s to the fronts of the blocks. The top levels of each block are terrace areas that provide private amenity space for the students and a bar / restaurant space for the hotel. These areas are selectively screened by an angled foil which is sculpted to provide views across the city towards key locations as well as give a dramatic addition to the skyline. “The tops of the buildings have been sculpted and carved to provide a softer finish to the buildings which relates more to the historic spires than the modern boxes. This has the effect of the buildings sweeping up rather than ending abruptly. 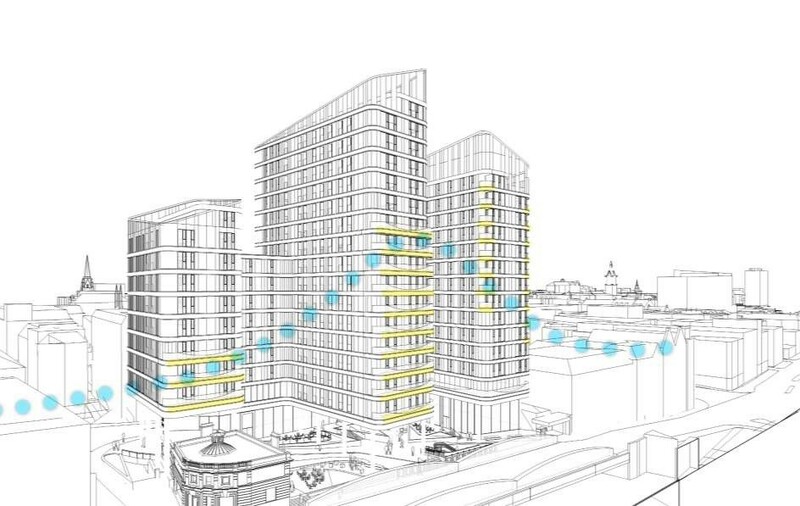 The proposed towers will be clad in anodised aluminium. Another eye sore from Halliday Fraser Munro. What is it John Halliday says at his own lectures...oh yes, "I'm a business man not an architect" well seen! A wave? Looks more like 3 out of place towers to me. Student accommodation in this location? Is this Malky earning his keep? or has the commercialism of HFM been the rocks that his 'wave' has broken upon? This doesn't offend me as much as I though it might, or as much as it does everyone else it seems. I like the public spaces, the incorporation of the old station building, the removal of the existing hideous 70s office, and the general regeneration of the area - make no mistake that this area is currently a prime hitshole. Something has always needed to be done between the new station and the back of the Trinity mall, the back end of the mall was always an untidy, unfinished project. Wireframe elevational view doesn't give away any detail or suggest any industrial estate blandness (more a flaccid-60s-brutalist effort), but considering the wider viewpoint of this development is extremely limited from any direction then I think they've done the right thing in focusing on the areas that will be physically used and seen close up at street level. Sick as I am of the HFM copy & paste routine, this one ain't too bad. Hopefully this leads on to the station/sq/union st/terrace gardens expansion that they sketched a couple of years ago, after the council bummed the democratic vote for the gardens project. Now we've got no money, increased unemployment, falling house prices, and a fraction of the oil jobs we had before, I wonder if old Barney 'Cockup' Crockett wishes he'd not stood in the way of the city centre developments. Dont like it much at all! Aberdeen’s Architectural problem is Holliday Fraser Munro - it’s a circular agreement designed to keep money in the city, to its detriment. HFM consists of a few guys that know how to operate software for design. They have no real design background beyond copy and paste which is a shame as Aberdeen suffers due to HFM having a large share of the cities construction and development projects. This has evolved through being in the right place at the right time and knowing the right people in the right places but in effect is non sustainable now that the oil industry has dipped so badly. They are seeking to move to London and open up shop there however the sad fact of the matter is that they will be exposed pretty quickly in such a challenging market.